Ouch! Damn with faint praise, as Alexander Pope once said (no known relation to Olivia, Scandal fans, although ole Alex created a few scandals of his own). Sure, it’s nice to hear you’re doing good work, but what my client knows—and what you need to know—is that good work isn’t cutting it anymore to make you stand out, be recognized, and get the opportunities to do what you love to do best. The difference between solid, operational, get-it-done work and awesome, game-changing, move-us-forward work is all about being strategic. Which isn’t helpful if it’s YOU who’s trying to be more strategic in your work. 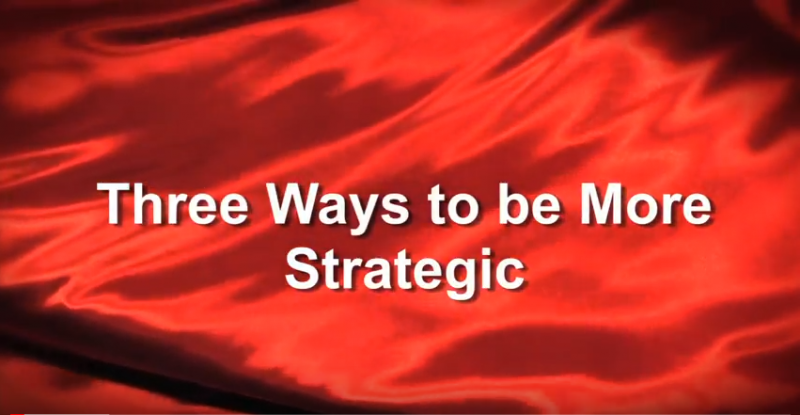 If you’re trying to be more strategic in your work, here are three ways I’ve found to help. This is a clip from a half-day workshop I taught targeted to communication and marketing professionals, but the strategies apply across most all industries and professions. (3 min, 56 sec). YOUR TURN: What’s the one thing YOU do to be more strategic in your work? I welcome your emails–just click here. Worried that others aren’t seeing your value right now? Or that YOU aren’t clear on your own value at work? My mini-course Create Career Clarity is a fast & powerful way to understand who you are and what you want at work, giving you the foundation to move forward. Click here to learn how you can get immediate access.